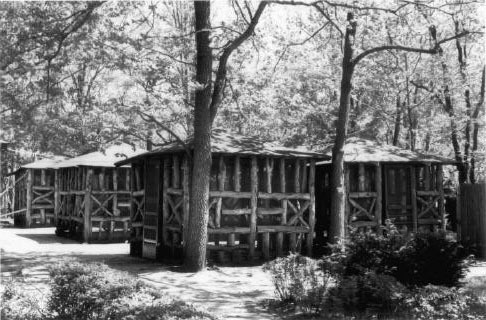 Busch’s Grove was a clubby, table-hopping haunt of privileged residents of Ladue, Missouri, and its environs. An unpretentious white frame roadhouse fronting right on a busy thoroughfare, it didn’t look like much from the outside – or the inside for that matter. It didn’t need to show off. This was its charm. I ate there just once, in the 1970s. I wanted to experience eating in one of the screened-in log huts in the restaurant’s back yard (pictured, courtesy Esley Hamilton). Even then they seemed quaintly out of sync with the times. I have no idea what I ate. What sticks in my mind is the elderly woman alone in the next hut with her dog. 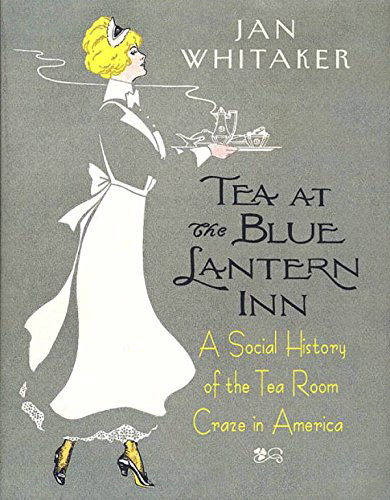 I remember a tall, white coated waiter bringing the dog’s dinner, a large serving of prime rib. Prime rib was what you’d expect at a restaurant as traditional as Busch’s Grove. As were iceberg lettuce, shrimp cocktail, and squishy soft dinner rolls. It was the kind of place where it wasn’t a bad idea to have a few Manhattans or whiskey sours before tackling your meal. 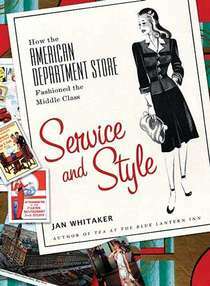 Nevertheless, in 1958 Holiday magazine gave the Grove a “Dining Distinction” award. As for the food revolution of the 1970s, it didn’t happen here. In 1998 a review by Joe and Ann Pollack in their book Beyond Toasted Ravioli made it sound as though the Grove was permanently stuck in the beef & bourbon 1950s. Though ostensibly giving a favorable report, they identified numerous red flags for discriminating diners such as packaged croutons; the strange “viscous texture” of the microwave-heated vichyssoise; garlic powder in salad dressings; vegetable medleys; and potatoes baked in foil. Perhaps the old roadhouse was in decline. The Pollaks characterized the restaurant’s decor as “Ralph Lauren when Ralph was still selling ties.” “Dowdy” would have been equally apt. But keep in mind that Ladue was (is?) the kind of town where actual living conditions could surprise you: such as the cockroach I once saw crawling on expensive grasscloth wallpaper in one stately mansion, or another estate filled with ancestral oil paintings but lacking air conditioning despite St. Louis’s tropical summers. 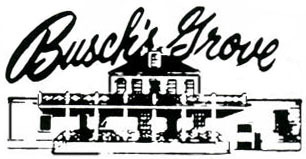 Busch’s Grove began its hospitality career in the 1860s as a stage coach stop 10 miles west of downtown St. Louis. It was not known as Busch’s Grove until it was taken over by John Busch in 1891. In the 1920s, when it was run by Busch’s son and a partner, the surrounding community of Ladue had grown into a woodsy enclave of wealthy families attracted in part by a number of country clubs that had located there. 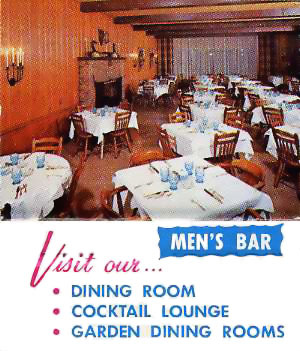 The restaurant served as an unofficial annex to the nearby St. Louis Country Club. No doubt patronage also derived from Ladue’s elite prep schools, among them John Burroughs, Country Day, Mary Institute, Chaminade, Villa, and Priory. Old patrons mourned when the restaurant closed a few years ago and was razed, along with the log huts. My Grandfather and I would eat here on bean soup day. We would share cheese nips and I would always get the french onion soup. I grew up a Busch’s Grove girl and loved the charm of those special days when we would eat in the huts. It’s been so many years and I can’t remember his name, Charlie maybe? The blonde man who parked the cars. He treated me like a princess when I was young as he ushered me into my dad’s car and later on in life gave me trouble about my music selection. I miss those days. Very special times indeed. His name was Kenny, and he was amazing. He ran the lot without using claim checks — he just had a knack for matching cars with faces. And he always looked sporting with the bandana tied around his neck! 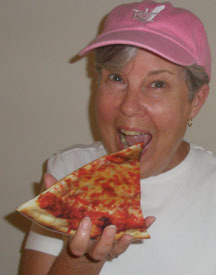 Suzanne, How well I remember many lunches at Busch’s Grove. The waiter’s name was Charlie (can’t believe you remembered) and the man that parked the cars was Ken! Those days were so special and I miss them! I am so glad that I planned Grandpa’s 85 birthday there…This was the last birthday we had together..
Oh Suzanne, Those were special days. Yes,it was Charlie the kind waiter. Many good times were spent at Bushes Grove! When I was 16 & 17 I worked there as a busboy in the summers (1975 & 76); when I was 18 I had my own house charge at the bar. Oh, the good old days! I wish this place was still around. I think of it as a St Louis Historical Site. We all have so many great memories of relaxed summer night dinners. We had our rehearsal dinner in one of the front left huts. Maybe someone one day will rebuild them somewhere. They must keep prime rib on the menu. In the early ’80s, this was the lunchtime watering hole for the management of KSHE-95. Nancy Jane Moessmer Pool was the atypical doyenne of this rock ‘n Roll leader for many years. When KSHE sold, she moved several of us to KWK. The leadership would lunch in the garden a couple of times a month – Nancy’s treat. Marcy Byrne, Bob Birch, I and a few others had the privilege of calling her ‘boss’ and friend. That is so funny! Thanks. Yes, I remember Otis! What a kind man he was. Oh boy I could tell you some stories !!!! Oooh, don’t be shy . . .
Would love a Russ’ Salad right about now!!!!! Many fond memories!!! My parents met at Busch’s Grove in the 1950s and had lunch there with their friends every Saturday of my childhood. As an adult, I never went to a wedding or a funeral where we didn’t end up there. My grandfather was the child of one of the four Litzsinger brothers that settled Litzsinger Road. His name was Frederick Litzsinger and he was born at Busch’s Grove. My dad worked at Busch’s Grove for years, first as a waiter, then as the bartender in the Men’s Bar. My sister and I were recalling restaurants our mom took us to in the 1940’s and I recall one called Ripley’s. It was Italian family style long tables serving all with self service tureens of soup, bread, salad, pasta, wine, before 1st course. The entrance was upstairs bar, downstairs restaurant was cave-like and people would sing rounds. I think it was in North Beach. Oh, it was San Francisco! Alas, I know nothing about this restaurant, nor can I find anything other than one single, short mention (assuming it’s the same place) which says it was a French restaurant, not Italian.